A powerful storm system swept across the East Coast on Wednesday, killing three people in Virginia and knocking out power to tens of thousands of homes and businesses in the region. A day earlier, the system spawned about two dozen tornadoes along the Gulf Coast, damaging hundreds of homes in Louisiana, Mississippi and Florida. Three people were killed and dozens were injured. The body of a man who'd been missing since a funnel cloud destroyed his home was found Wednesday night in Appomattox County, Virginia, NBC News reported, citing authorities. The funnel cloud cut an 8- to 10-mile path of destruction through the area injuring seven other people, two of them seriously. A tree fell onto a man a death in Darlington County, South Carolina, the county coroner told NBC News. He was identified as Michael James Sr. Forecasters warned the threat wasn't over and that more than 88 million people were at risk Wednesday of seeing some sort of severe weather. In the Midwest, heavy snow and biting winds led to mass flight cancellations at Chicago airports and school closings in several states. In Virginia, Gov. Terry McAuliffe declared a state of emergency Wednesday evening. The tiny farming town of Waverly in the state's peanut-growing region took the brunt of the storm there. 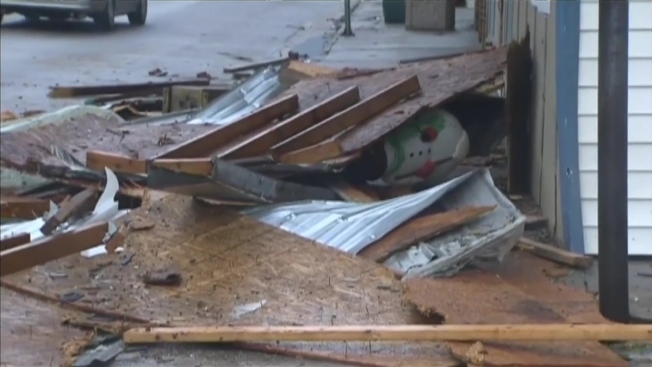 Around 30 twisters were reported Tuesday, the National Weather Service said, including one that traveled around two miles in Pensacola, Florida, smashing into an apartment complex, according to NBC News. City resident Shawn Brown, 34, told NBC News in the aftermath that the place looked like a "war zone," saying trees were shredded and cars were tossed everywhere. A tornado warning was declared for the Washington, D.C. area, and a tornado watch for the Philadelphia area Wednesday, as the storm moved up the East Coast. Weather advisories stretched all the way up to Maine. The Virginia State Police said at least five structures were damaged in Waverly, a town of approximately 2,000. 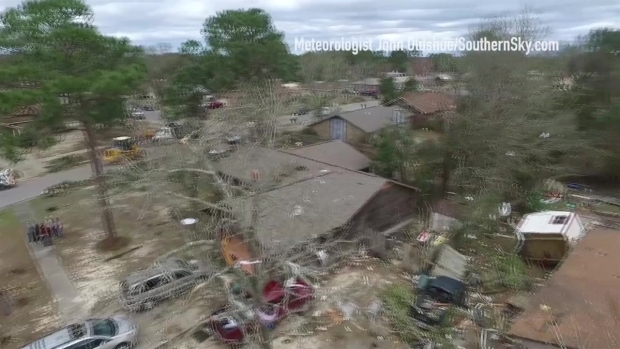 Drone video shows damage to houses in Pensacola, Florida. The names of the victims were not released, but state police spokeswoman Corinne Geller said in a statement that they were a 2-year-old child and two men, ages 50 and 26. She said their bodies were found about 300 yards from their mobile home. Roads leading into the town had to be closed because of downed trees and debris tossed by winds gusting to 60 mph, Geller said. Witnesses said the storm swept through Waverly with little warning. Timothy Williams said a friend had just come by to take his new car for a drive when the storm hit. "It picked the car right off the ground, and put it right back on the ground," said Williams, 44. He said they remained in the car until the storm passed. The storm blew down electrical wires "in a big ball of fire, thrashing all about each other," Williams said. He said they both escaped shaken but uninjured. "I'm just a little nervous and jittery, but overall I'm OK," Williams said. On Tuesday, one of the hardest-hit areas along the Gulf Coast was a recreational vehicle park in the town of Convent, in southern Louisiana. RVs were tossed about and lay on top of wrecked cars and pickup trucks. Two people were killed there, and 31 injured people were taken to area hospitals, said St. James Parish Sheriff Willy Martin. An all-night search of the RV park found no additional injuries or fatalities, the sheriff said. One person was still unaccounted for. Briaxton Lott, 23, was in the trailer park when the tornado hit. The pad where his trailer once sat was empty and he pointed to the remnants of it about 100 feet away. "The whole front end came up and slammed back down, and I grabbed up the baby and the next thing I know we just went rolling end over end," Lott said. Funnel spotted just a bit ago on I-95 at SR60, west of Vero Beach. Witness says it never touched. His destroyed trailer ended up right next to three trailers that appeared untouched. Children's toys were scattered in the mud, and an alarm could be heard going off in the morning, likely alerting a long-gone resident it was time to go to work. Bill Bunting with Storm Prediction Center estimated 20 to 24 tornados hit from Louisiana to Florida on Tuesday. Crews were still surveying so he couldn't be more specific. The storms dumped several inches of rain in Alabama, Georgia and elsewhere, causing flash flood watches. Schools were closed in parts of Georgia, Florida and the Carolinas ahead of the storms. In Mississippi, 73-year-old Dale Purvis died of blunt-force trauma in a mobile home west of Purvis, Lamar County Coroner Cody Creel said. Florida Gov. Rick Scott said an apparent tornado in the Pensacola area significantly damaged more than 70 homes and 24 apartments, leaving three people with minor injuries. He stopped at The Moorings apartment complex, where winds ripped the roof off of at least two buildings. Residents in LaPlace, Louisiana, were cleaning up Wednesday after a tornado ripped up trees, tore roofs from houses and terrified local residents. 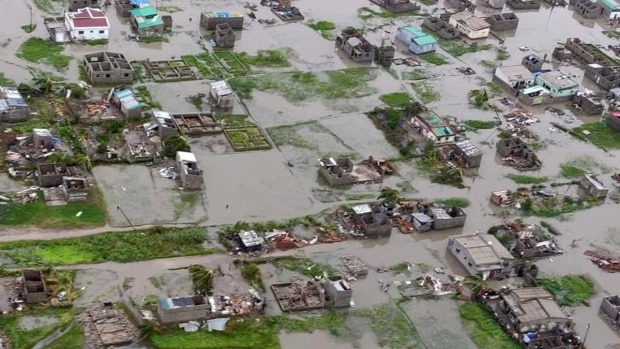 Nearly 200 homes were damaged. In one neighborhood, the hum of chain saws and generators could be heard as people cut downed trees, fixed damaged roofs and patched shattered windows. A trampoline was wrapped around a tree and houses were missing shingles or parts of roofs. Darren Miller, 52, was helping his parents fix damage to their house after a decades-old oak tree had gone through the roof, causing water damage inside. Miller was there the day before and saw the twister rip through. He was just coming back to the house from retrieving a laptop from his car, when the tornado hit. At one point, he said he couldn't even see across the street. He ran into the house and told his family to hit the ground, just as the windows exploded. "It felt like a long time but I guess you could say within a minute. It was real quick," Miller said. "It will make your heart pump." Down the block, Rose Fuselier, 80, had a gaping hole where the front window once stood. "The whole backyard is covered with trees and then my shed is torn up too. The roof is gone and the siding is partially gone," she said. Still, she said others suffered damage even worse than hers: "I lucked out. I lucked out." Associated Press writers Rebecca Santana, in LaPlace, Louisiana; Melissa Nelson-Gabriel in Pensacola, Florida; Bill Fuller and Chevel Johnson in New Orleans; Freida Frisaro in Miami; Alanna Durkin Richer and Steve Szkotak in Richmond; Kasey Jones in Baltimore and Jeff Martin in Atlanta contributed to this report.